Photographed from Montelius’ publication by Ola Myrin, SHMM. In this phographed version the scale is not 1:1. The bead is only 29 mm long and 19 mm wide. On the 29 September last year I wrote a blog post about the small bone bead found at the Alvastra pile dwelling. I said that I knew of no parallels to this bead. Before making such a statement one should always check Oscar Montelius’ book Minnen från vår forntid from 1917 (Montelius 1917, fig. 684.) Many of the classic artifacts in Stone Age collections known at this time are depicted there. I had not done this. It was not until I recently re-read Gunborg O. Janzons monograph on the dolmen in Alvastra that I discovered a parallel to the Alvastra pile-dwelling bead from a megalith in the Falbygden area. 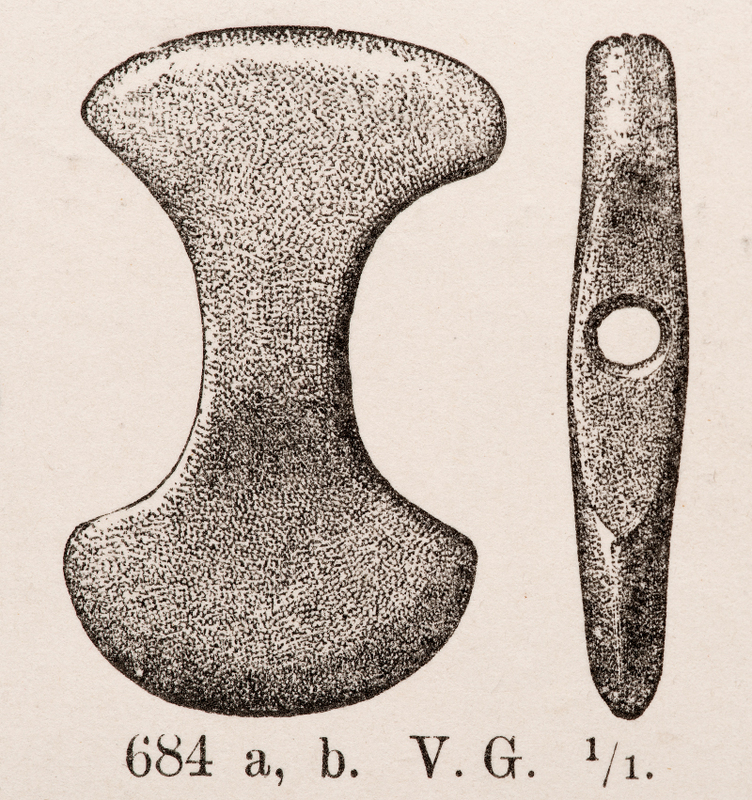 A bone bead in the shape of a double-edged axe was found in ancient monument 7 (Raä 7) in Falköping. This megalith, Frugården, is a passage grave. The bead belongs to a large collection of objects bought from Verner Hilder by the Museum of National Antiquities, now the Swedish History Museum, in 1872. It is c. 29 mm long and 19 mm wide, thus a little bigger than the Alvastra bead which is 23 x 15 mm. The Falbygden bead is also in one piece, unlike the bead from Alvastra which was found in two parts in two different excavation squares. Connections between the Falbygden area and the Alvastra area have previously been discussed by many archaeologists. This broken bead can form a further link in that discussion. Unfortunately I have been unable to locate this bead from the Falbygden megalith in the collections of the Swedish History Museum (accession number 4840, probably subnumber 132 described in the catalogue as a pendant of approximately correct dimensions). I have checked with all the archaeologists known to me who have studied the collections in the past 20 years. None of them recalls seeing this bead. I have also checked with the local museum in Falköping.